6. 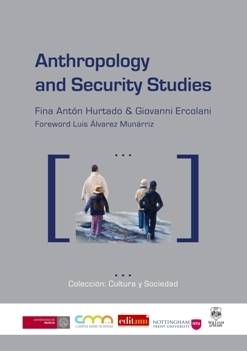 Anthropology and Conflicts, Marco Ramazzotti; Conclusions: A New Grammar for International Relations in a New World Order, Maurizio Boni. Giovanni Ercolani is a Social Anthropologist, researcher at the ‘Jean Monnet Chair’, Dept. of Anthropology, University of Murcia (Spain), and Thesis Advisor for the ‘Peace Operations Training Institute’ (POTI, USA). A Doctor in Political Science and Oriental Studies,both from the University of Roma (‘La Sapienza’, Italy), he holds a M.A. in Politics and Government from the St. John’s University (USA), and a Master in Social Anthropology from the University of Murcia (Spain). Previously, Dr. Ercolani served at the NATO COMLANDSOUTHEAST HQ in Izmir, Turkey, and has been a Research Associate at the ‘Scottish Centre for International Security’ at the Aberdeen University (UK). Dr. Ercolani has been lecturing on international security issues, and political anthropology in Italy, the United Kingdom, Spain, Portugal, Slovenia, Bosnia-Herzegovina, Romania, Albania, Turkey and China. He is a specialist in Anthropology and Security Studies, International Terrorism, Security Studies, International Relations, Human Security, Conflicts, Peacekeeping and International Conflict Resolution, CIMIC, the Geopolitics of Energy, and Energy Security. He is a regional expert on Turkey, the Caucasus, and the Black Sea. Dr. Ercolani is Fellow of the ‘Royal Anthropological Institute of Great Britain and Ireland’ (RAI, London, UK), member (elected) of the ‘Royal Institute of International Affairs’ (RIIA, London. UK), member (elected) of the ‘European Association of Social Anthropologists’ (EASA, London, UK), and member of the ‘Royal United Services Institute (RUSI, London, UK).